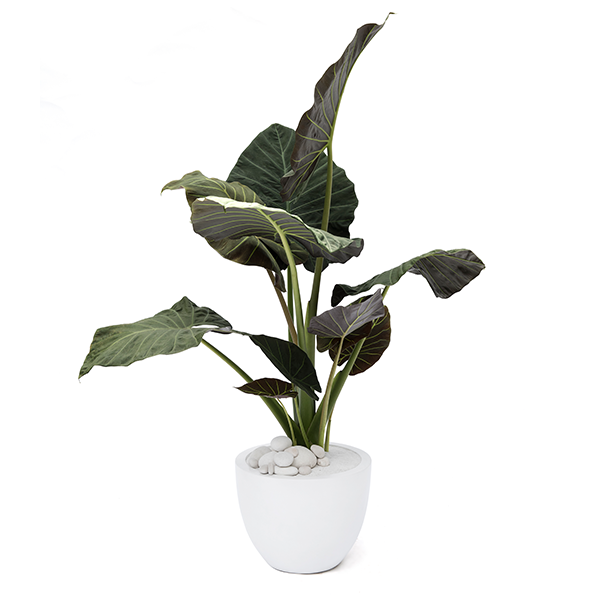 My botanical name is Alocasia ‘Regal Shields’ but I am also known as Elephant Ear ‘Regal Shields’. I have a large flat deep green leaves. I am native to Africa but I was grown in Florida and am so happy to be going to my new home. I can grow between 5-6 feet tall and will add beautiful full, green look to your home. Here are some care instructions and tips that will be useful as I get acclimated to my new home and grow with you for many years to come. My personality is wild, tropical, grand and architectural. I will grow tall and strong so make sure to put me in a location with plenty of space. You can also place me on terraces, balconies as I am resistant to the wind. You can place me in living rooms, hallways, bedrooms, offices, conference rooms, or anywhere with plenty of light. If you place me against walls such as room corners, rotate my container so all of the foliage gets even light. I will be happiest indoors where I can get bright, indirect light such as near a south or north-facing window. Make sure that I receive bright light daily but that rays of sunlight do not hit my leaves. I tend to grow in the direction that I am receiving light. Indoors in a Floridian home, I will be happy in an environment that is controlled around 77° F (25° C). Make sure that I am not in direct line of contact to air conditioning or heating vents. I would not like to receive cold or hot air blown at me. I am resistant to wind, so feel free to place me in my container on balconies, terraces or backyards as long as I have some shade. I will not be as happy in direct or full sun. When it comes to watering me, below are some helpful suggestions for you to follow. Keep in mind that every plant, like every human, is unique and our needs change over time. Depending on where you end up placing me, I may get more or less thirsty and would require watering with more or less frequency. The humidity in the room, the time of the year, and the amount of AC/Heating, among other factors will all affect my watering needs. Fortunately, it’s easy to figure out what to do as I will show you how I feel; you just need to check up on me once in a while. Start by watering me once a week. Use a spray bottle, watering can, or measuring cup to water me with approximately 16 ounces (473 ml) of watering per session. Pour water slowly all around the center of the plant so that it filters down the base. Watering is no good to me if the water runs down the outside of the root ball, leaving my central roots dry. This can happen if you water too quickly or apply too much water at once. Slower watering is usually more effective. The key is to ensure that water gets to my root zone. Sometimes it is helpful to prick little holes into the gravel and soil with a dull knife or the end of a pencil and pour water inside to assure it goes down well. Check up on the same day of the month by inserting your finger into the soil about half an inch and feel the moisture level. If it feels moist, try again in a couple of days. If the soil feels dry, you need to water me as instructed above. I like moist but not soggy soil. Once we do this for a few weeks, you will get the hang of it and you can determine the best watering schedule for your light, temperature and moisture conditions. You should also make sure that only person is in charge of my care schedule. This way, we can form a loving relationship and I don’t get watered more or less often than I need to be. You can use diluted regular houseplant fertilizer once a month or during the growing season of spring through early fall. Too much plant food causes excess salt build up in the soil that can result in leaf burn. The leaves tend to face towards the ray of light, so it is a good idea to rotate the plant occasionally. Make sure I am not being burned by harsh, direct sun. Use distilled water rather than tap water to prevent the build-up of minerals.